Where Do Research Nurses Work? What Is a Research Nurse? Research nurses conduct scientific research into various aspects of health, including illnesses, treatment plans, pharmaceuticals and healthcare methods, with the ultimate goals of improving healthcare services and patient outcomes. Also known as nurse researchers, research nurses design and implement scientific studies, analyze data and report their findings to other nurses, doctors and medical researchers. A career path that requires an advanced degree and additional training in research methodology and tools, research nurses play a critical role in developing new, potentially life-saving medical treatments and practices. A highly specialized career path, becoming a nurse researcher requires an advanced degree and training in informatics and research methodology and tools. Often, research nurses enter the field as research assistants or clinical research coordinators. The first step for these individuals, or for any aspiring advanced practice nurse, is to earn a Bachelor of Science in Nursing degree and pass the NCLEX-RN exam. 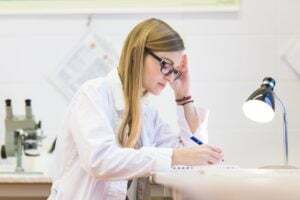 Once a nurse has completed their degree and attained an RN license, the next step in becoming a research nurse is to complete a Master's of Science in Nursing program with a focus on research and writing. MSN-level courses best prepare nurses for a career in research, and usually include coursework in statistics, research for evidence-based practice, design and coordination of clinical trials, and advanced research methodology. To search and apply for current nurse researcher positions, visit our job boards. What Are the Education Requirements for Research Nurses? The majority of nurse researchers have an advanced nursing degree, usually an MSN and occasionally a PhD in Nursing. In addition to earning an RN license, research nurses need to obtain specialized training in informatics, data collection, scientific research and research equipment as well as experience writing grant proposals, research reports and scholarly articles. Earning a PhD is optional for most positions as a research nurse, but might be required to conduct certain types of research. Aside from a higher nursing degree, such as an MSN or PhD in Nursing, and an active RN license, additional certifications are often not required for work as a research nurse. However, some nurse researcher positions prefer candidates who have earned the Certified Clinical Research Professional (CCRP) certification offered by the Society for Clinical Research Associates. In order to be eligible for this certification, candidates must have a minimum of two years' experience working in clinical research. The Association of Clinical Research Professionals also offers several certifications in clinical research, including the Clinical Research Associate Certification, the Clinical Research Coordinator Certification and the Association of Clinical Research Professionals - Certified Professional Credential. These certifications have varying eligibility requirements but generally include a number of hours of professional experience in clinical research and an active RN license. A research nurse studies various aspects of the healthcare industry with the ultimate goal of improving patient outcomes. Nurse researchers have specialized knowledge of informatics, scientific research and data collection and analysis, in addition to their standard nursing training and RN license. Nurse researchers often design their own studies, secure funding, implement their research and collect and analyze their findings. They may also assist in the recruitment of study participants and provide direct patient care for participants while conducting their research. Once a research project has been completed, nurse researchers report their findings to other nurses, doctors and medical researchers through written articles, research reports and/or industry speaking opportunities. What Are the Roles and Duties of a Research Nurse? The Society of Clinical Research Associates reported a median salary for research nurses of $72,009 in their SoCRA 2015 Salary Survey. Salary levels for nurse researchers can vary based on the type of employer, geographic location and the nurse's education and experience level. Healthcare research is a growing field, so the career outlook is bright for RNs interested in pursuing an advanced degree and a career in research.